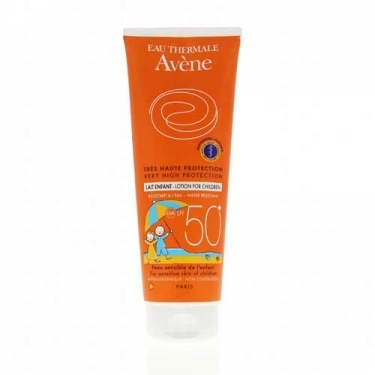 DESCRIPTION: Avène Lait SPF 50+ Enfant from Avène is a sunscreen milk designed thinking about the hypersensitive skin of children. Formulated with a combination of patented agents Sunsitive and enriched with Vitamin E and Avène Thermal Water, is effective and safe in UV protection while also protects from free radicals, soothes and moisturizes. Waterproof. Hypoallergenic and non-comedogenic. Without perfume. Apply before sun exposure. Repeat the application every 2 hours. Ideal for skin hypersensitive to the sun, skin exposed to intense sunlight and/or skin allergic to perfume.